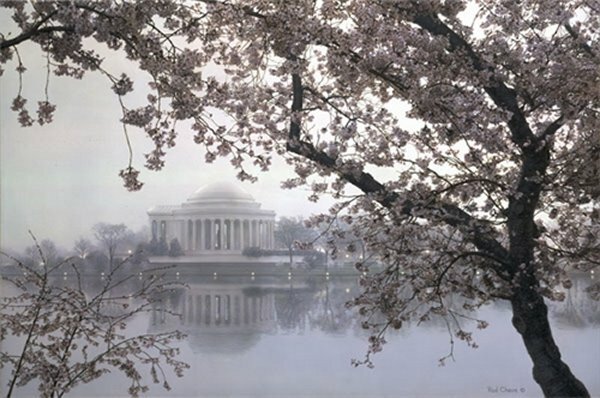 The Jefferson Memorial is seen across the tidal basin with Washington's famous cherry blossoms framing the scene. Jefferson was the only man in his day to foresee the "magnificent destiny" due our great nation. He was responsible for the Lewis and Clark Expedition which eventually led to uniting our country from shore to shore. He also saw the need to have New Orleans as a port at the base of the Mississippi River to encourage and enable commerce in the center of the nation. To that end, he negotiated the Louisiana Purchase. Cherry blossoms have a deep significance in Japanese culture and are a traditional motif in art, literature and cuisine. Over four hundred varieties of cherry trees grow in Japan. The blossom is a symbolic national flower and sometimes is offered to other nations as a symbol of friendship.